At some point on Wednesday, my brain became thoroughly convinced that it was Friday, and I still have not quite recovered from it. Still, the week has not been a total loss (though I remain rather lost). Today, my new-to-me Schacht Inkle Loom arrived. I meant for this sweater to be for a baby born last year, and I do not really remember what happened, but fast-forward to now, and I have this sweater, and I am pretty certain that it is too small for the little girl. Asking the mommy about her baby's wingspan to see if this would still fit seems wrong, so I am holding onto the sweater for some future baby. I just now got around taking pictures of it, and I fall in love with the little kitty buttons every time I look at it. 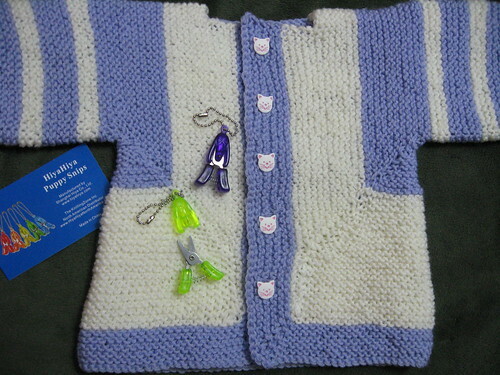 Speaking of little, I also never showed you the cute little prizes resting on the sweater. They are HiyaHiya Puppy Snips that I received from a friend. It has been a long time since I felt the need to own one of something in every color, but I think these adorable little scissors may have brought me nearly to that point. They are fabulously handy little snips, and I feel compelled to show them to everyone whenever I use them. Now, I somewhat show you something that is neither little nor late. It is a gift for a friend, (those of you who have seen and know what this is--shhh, please) but not exactly for a particular occasion, and, therefore, not late. I will show it after it arrives where it belongs, but we all know my postal procrastination, so no holding of breath, please. When I heard about the Emily/Emily2 knitalong, I knew that I wanted to play. Then, I thought that it would be a great gift for a friend, and worried that my participation as a knit-along-er would be terrible if I could not show my progress. At that point, I realized I had gotten ahead of myself, and there was much I needed to do before I could join in on the fun and games. So, I set to the tasks of finishing one project and making progress on a couple of others, and then deemed myself eligible to play with friends. I seriously think I have earned this, as I even made a decent dent in my Chalet Sock from PSCNeverHappened2009. Next up was yarn selection time. I decided that I wanted to use the alpaca/silk yarn I spun for the TdF 2009. I thought it would be a great choice for the pattern, and I had wanted to knit it into a gift for my friend for quite some time. Then, I could not find it anywhere. I searched high and low, and began to wonder whether I had given it away. Somewhere in my brain, I remember getting the yarn out to see if would work for some project, but that was my last memory of it. Finally, I unearthed a knitting bag that has not seen much use for quite a while, and lo and behold, I found the yarn. However, at this point, things had become a little bit complicated. First, I became quite enamored with a few other yarns in the stash. One of them led me to think about knitting Emily2 for yet another friend. It would also be a bit of a different experience, and a bit of a gamble. However, it would not require me to use beads, although it would not rule them out, either. So, all I know for now, is that I am going to knit Emily2 whenever the kal begins. Damask's last appearance was the cast-on plus a few rows. The experience of knitting with the silk single was interesting. I did not fully understand this until a later experience, but more on that another day. The nupps were more challenging in silk than in wool. Still, I enjoyed knitting Damask, and it is a great pattern. As I had no way to get more of the yarn, and it was knit from many stitches from the bottom up, I decided to go for the medium size. I was concerned that it might be too small, but was more worried that I would run out of yarn. So, I cast on with my US 8 needles (5mm), and knit the rest with US 4 (3.5mm) and hoped for the best. A mere eighteen grams later, I was done. Knitting the medium size was the right choice. Now I just have to wait for Mother's Day to give this to Mom. I finished this almost three months ago, but only now am I free to show it. It was a birthday gift for my friend, Helen. Her birthday was in December, but travel, holidays, and weather kept us from getting together, until last week when I was finally able to give this to her. 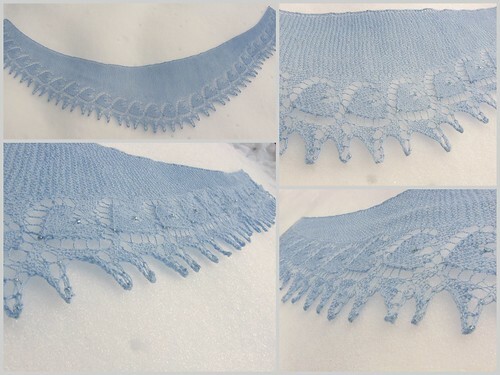 I knit the Heart to Heart Beaded Scarf for her in Misti Alpaca Lace in this beautiful blue. I was quite pleased by how well it suited her when she put it on, but in a fit of camnesia, I forgot to take a picture. You will just have to settle for its January snow photo shoot.